With so many crossover SUVs to choose from in the highly competitive auto industry, it can be difficult for drivers to know which model would best fit their specific needs, even for the knowledgeable and savvy shopper. Mazda has made it a lot easier for drivers by designing and building an incredible option – the Mazda CX-3. The new 2019 Mazda CX-3 is a subcompact crossover SUV that delivers incredible performance and fuel efficiency on the road while also offering an amazing list of technology features, comfort options, and active safety systems. 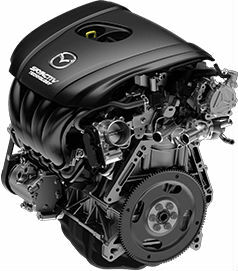 Helping the 2019 Mazda CX-3 to deliver the performance specs and fuel economy rating you’re looking for in your new subcompact crossover SUV is Mazda’s innovative SKYACTIV® engine technology. Underneath the hood of the new 2019 Mazda CX-3, you’ll find a SKYACTIV®-G 2.0-liter four-cylinder engine that pushes out 148 horsepower to your choice of either a front-wheel drive system or Mazda’s i-ACTIV AWD® traction control system. The new 2019 Mazda CX-3 also offers a Sport Mode feature that puts the power of this new crossover in your hands. Selecting the Sport Mode dynamic drive feature amplifies the responsive acceleration of the new Mazda CX-3 and offers quicker throttle response which comes in handy when merging into traffic or passing other vehicles. 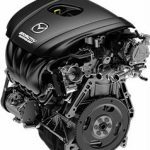 The following information will show you the fuel economy rating of both the 2019 Mazda CX-3 front-wheel and all-wheel-drive models. Which Mazda is Best for Towing? This entry was posted on Friday, September 21st, 2018 at 3:27 pm	and is filed under Mazda CX-3. You can follow any responses to this entry through the RSS 2.0 feed. You can skip to the end and leave a response. Pinging is currently not allowed.